Everyone agrees that storm water that falls on the Glenview Park Golf Club, regularly flooding the course and surrounding homes, has to go someplace else. 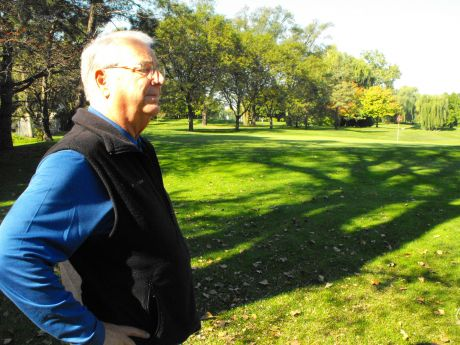 A project designed to divert water off the Glenview Park District’s golf course and away from a neighboring subdivision was supposed to begin this fall, but local officials put on the brakes in the wake of opposition from residents of another nearby area. “The people are mad,” said Clifford Huske, a proponent of the recently halted plan who lives in the Country Club Gardens neighborhood east of the golf course. Those residents have been pushing village and Park District officials for years to tackle the chronic flooding problems in their neighborhood, Huske said. The plan was to dig a swale along the east side of the golf course, which is near Central and Shermer roads, said Cheryl Deom, superintendent of special facilities for the Park District. Water would flow through the ditch to a detention area, where it would sit until it drains, she said. “It’s really been the village’s project, because it’s been a storm water issue,” Deom said. An empty, village-owned lot along Central Road also was part of the equation. That area was eyed for additional detention until some residents along Central Road objected. The lot sits next to the home of Bill Finn, who said it has become something of a neighborhood playlot for children and a pathway for locals traversing the neighborhood. When he learned of the proposal to use the area for water detention, he petitioned others on the south side of the golf course in an effort to get government officials to change their plans. “We are the most affected by it, but we were the last ones to know,” Finn said. He said he worried that detaining water on the site would exacerbate flooding on his property, which he said is already a problem that he attributes to grade changes on the golf course. Factor in safety issues and a loss of trees, and the neighborhood would have a problem, Finn said.